“The last papá said to me, the last word from his lips, was ‘Kamchatka’. He kissed me, his stubble scratching my cheek, then climbed into the Citroën. The car moved off along the undulating ribbon of road, a green bubble bobbing into view with every hill, getting smaller and smaller until I couldn’t see it any more. I stood there for a long while, my game of Risk tucked under my arm, until my abuelo, my grandpa, put his hand on my shoulder and said, ‘Let’s go home’. 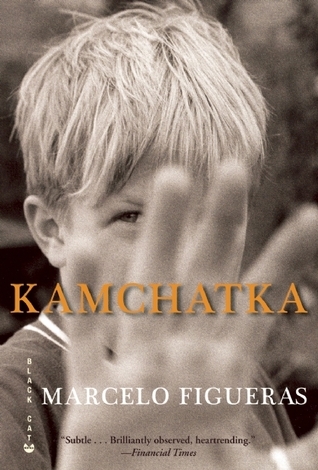 Harry, who is 10 years old, is the narrator while his family goes into hiding on the outskirts of Buenos Aires. They leave their comfortable home very suddenly and Harry misses his toys and especially his Risk board game. Harry isn’t his real name, but the name he chose when he had to choose. His parents were too involved in politics when the military junta came to power again in 1976 so they went into hiding. So he chose his name after Harry Houdini, his little brother, the Midget, chose Simon after a cartoon hero. A 18 year old boy, called Lucas but that’s not his real name, joins the family in hiding and Harry and the Midget are terrified that he will become their parents’ favourite. It’s sad to read a book where you know from the first page that the father will disappear. But still it is a warm book and Harry’s observations and thoughts are great. He is a very clever boy, sometimes I think he is too clever for a 10 year old and he is obsessed with old wars and the universe. And because you only see the world from Harry’s eyes, you never get to know the whole picture. His parents and Lucas are talking a lot of politics, but Harry just tunes it out. Although I know that the story is supposed to be that way, it’s a bit annoying because I always want the whole picture (and much more apparently) when I read.